Following the release of the article “Thermal analysis of a lengthy section of a gas pipeline on permafrost”, we received lots of questions from users. In this post, we cover the more frequently asked questions concerning the functionality of the updated version of Frost 3D Universal software. Firstly, however, we would like to remind readers that the new version of the software was released in May, 2014. Here, we implemented new technologies in the architecture of the software and its main components, which enables the calculation of computational meshes as large as 100 million nodes on a PC. To demonstrate the extraordinary performance of the newest version of Frost 3D Universal, we conducted the thermal analysis of a long section of pipeline lying on permafrost, with a mesh consisting of 58.5 million nodes. Question: Why do we need such large computational meshes? 1) The computation of extensive regions and long or massive objects often involves many elements for discretization in the computational domain. 2) There are often relatively small elements in the computational domain; there could, for example, be a thin layer of heat insulation, or ground strata. A significant increase in mesh refinement is required to discretize these relatively miniscule elements. 3) Areas with significant temperature gradients (near heat insulators, heat sources, cooling devices, etc.) require increased computational mesh density, consequently significantly increasing the total amount of nodes in the computational domain. Note that even with the use of a non-uniform cell size (at irregular computational mesh), for example, we still need a lot of nodes. The increase in the cell size in irregular computational meshes needs to be very smooth; otherwise, the numerical method returns significantly less accurate results. Question: Why not create a coarser mesh and reduce the number of elements by several times; therefore, you won’t need such large computational meshes and the computation itself would be faster? Answer: It is true that coarser meshes accelerate the numerical computation, but at the same time this significantly amplifies inaccuracy. For example, for precise computation, the minimum number of elements which the object should be discretized into along one of XYZ directions is two. In the computation of our lengthy section of pipeline, the heat insulator was discretized into four cells in the Z axes; this allowed the influence of the insulator to be factored in with a minimal degree of inaccuracy. Even in areas with large geometries and no small elements, the cell size cannot be increased dramatically as it is limited by the heat process velocity, especially the phase front velocity. Because of this, using coarser meshes could lead to incorrectly calculated models. Answer: Exactly, it’s true. Frost 3D Universal software is not a universal system for finite-element analysis like other common CAE-applications. This software was expressly developed for simulating thermal processes in grounds,including phase transitions. That’s why Frost 3D Universal developers created specialized mathematical solvers optimized for this particular problem. Also, during the development we applied the latest technological achievements in the field of parallelization of mathematical algorithms that have enabled the acceleration of computations by several times. For more information regarding this, read here and here. Question: Why it was impossible to simulate a kilometer-length section of the pipeline in older versions of the software? Answer: 32-bit versions of the software couldn’t handle computational meshes like this due to the limitations of the operating system which can only address 4GB of RAM. Considering that approximately 2 GB are necessary for the operating system itself, only 2 GB are left for the application; this is simply not enough for large computational meshes where computation is based on very large matrices processing. Also, innovative approaches were used in the software for implementing the most resource-intensive modules; this is described in the article itself. Question: Is it possible for the previous version of the software to compute 10 separate 100-meter pipeline sections, and then combine these results into one resulting picture? Answer: Even if we divide the computational domain into two parts, it is impossible to set an adequate boundary condition on the obtained borders because the thermal field from the first part influences the thermal field of the second. It is only possible to divide the sections of the pipeline when the two parts are totally geometrically symmetrical or if there is no heat flowing from one part to another. In any other situation, simulation results will be inaccurate. Question: There are well-known finite-element analysis systems such as ABAQUS, Nastran and Ansys where it is impossible to create PC models with, let’s say, 10 million finite elements due to hardware restrictions (RAM above all). How did you manage to create a computational mesh of 58 million cells in Frost 3D software? Do you work with the mesh in real time? Answer: In the latest version of Frost 3D Universal software, the main emphasis was on the optimization of memory and visualization. That’s why in the newest architecture of the software, we divided the application into a series of subprograms which are automatically cleared from the memory if the user isn’t working with it, thus releasing all available resources for program execution. The implemented technology enables fast loading/releasing of the necessary resources. 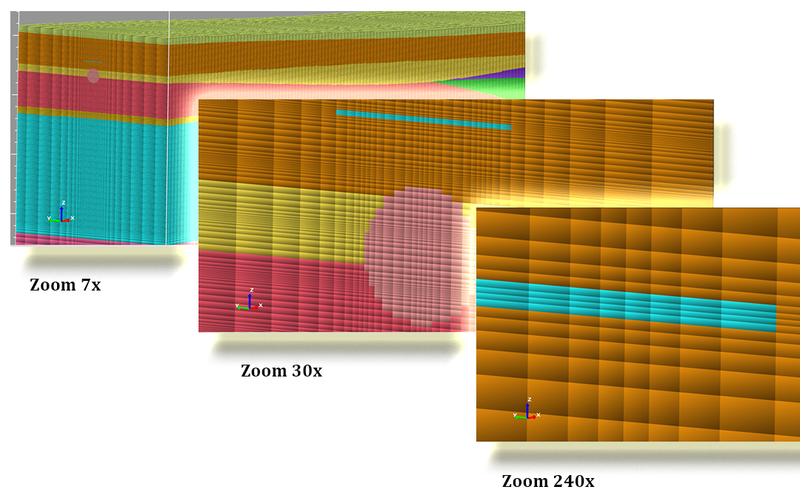 In addition, the Frost 3D Universal software employs graphics strategies used in video games; the latest versions of shaders (special programs performed on video cards) were utilized as well as a powerful new preprocessing engine for the computational domain and data visualization. This entry was posted in Frost 3D Universal and tagged cooling devices, discretization of the computational domain, finite-element analysis, heat insulation, heat insulators, large computational meshes, long section of pipeline, non-uniform cell size, parallelization of algorithms on GPU, thermal analysis. Bookmark the permalink.